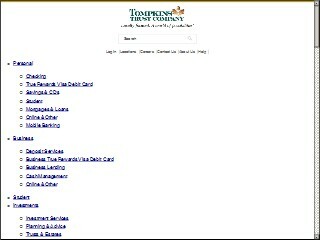 Description: Tompkins Trust Co is a business categorized under banks, which is part of the larger category national commercial banks. Tompkins Trust Co is located at the address 86 North Street, Auburn, NY 13021 in Auburn, New York 13021-2682. The Manager is Tony Franceschelli who can be contacted at (315)255-9078. Location & access map for "Tompkins Trust Co"